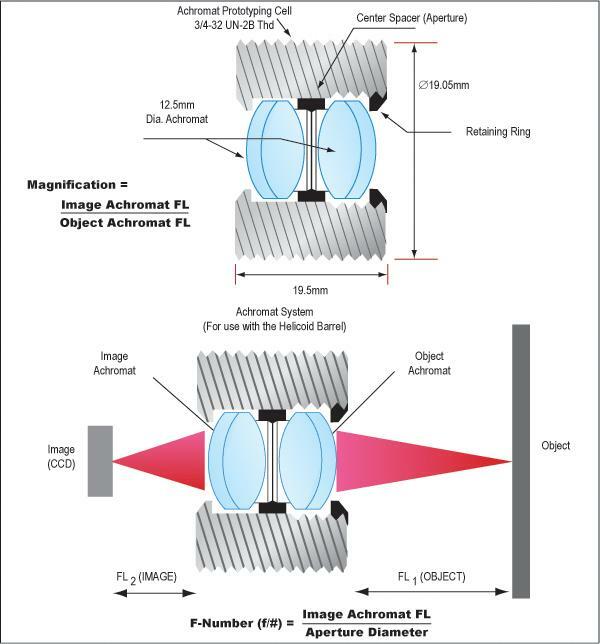 With the possibility of the Harsh Environment Lens system not being compatible in a vacuum environment, the other, more challenging option, is to use an achromatic doublet. There are a lot of achromatic lenses available from Edmund, giving us almost unlimited choice in optical configuration. The page on these lenses is here. Further information is available here. Achromatic lenses have two optical components cemented together to form an achromatic doublet which is designed to correct for on-axis spherical and chromatic aberrations. The lenses from Edmund Optics are available with a single layer MgF2 coating or a broadband multi-layer coating for the visible spectrum. All dimensions are in millimetres. The two elements composing an achromatic lens are paired together for their ability to correct the color separation (dispersion) inherent in glass. Without chromatic abberations, achromatic lenses offer the best option for polychromtic imaging. To obtain the best choice of lens, one must be selected using criteria set by the detector. It is likely that the maximum dimensions parallel to the imaging plane will be set by the detector. The lens must be wide enough to produce an image over the entire area of active pixels of the detector chip, this wuill also be a large factor affecting the length of the optical path length.